Left column: Node list organized by categories. Click on a category drop down arrow to see the available nodes. Use the search field at top of the column to search for nodes by name or description, or use keyboard shortcut ⌘F to shortcut to the search field. Center: Canvas where nodes can be linked together to create a workflow. Upper right column: Inspector palette where nodes currently on canvas are shown with available settings and adjustments. Checkbox option to enable/disable nodes present. Lower right: Image preview window and scrubber to scroll through images present. Click on image thumbnails to bring up the image in the preview window. Underneath the preview window are the zoom magnification slider, preview background color toggle button, and image information button. Click the 'i' for specific image information including file size, file name, any classifications present (Pro version only), color profile, DPI, image size, and much more. Top center: Run button and processing status bar. Clicking the run button executes a workflow. When a workflow is being run, the progress bar will give an ETA of when it will be completed. If critical pieces are missing in a workflow, a warning symbol will appear in the status bar. Clicking the warning symbol will provide more information. Top right: From left to right - toggle image preview, online forums, and online documentation buttons. Top left: Close, minimize, and full screen buttons. Drag and drop a folder of images onto Retrobatch's canvas. A Read Folder node will be created. Drag and drop a folder onto a "Read Folder" node and it will change its input folder. Double click on 'Read Folder' in the lefthand node column. A Read Folder node will be created. Then, in the inspector palette located on the righthand column click 'choose' to select a folder. Drag and drop the 'Read Folder' text in the lefthand column onto the canvas. A Read Folder node will be created. Drag and drop a single image onto Retrobatch's canvas. A 'Read Individual Files' node will be created. Double click on 'Read Individual Files' node in lefthand node column. A node will be created. Drag and drop images onto this node or click the '+' button in the inspector palette to select images. Create a droplet. Use the File ▸ Save As Droplet… menu item to write out your workflow as an application. You can then drag and drop folders and images to run your workflow. To re-edit a workflow contained in a droplet, either hold down the option key when opening the droplet, or drag and drop the droplet onto the Retrobatch app icon. Double click on the node name in the lefthand column, and the node will be added to the canvas. Click and drag on the node name in the lefthand column and place it in the canvas. On the menu bar, go to Edit ▸ Add Node and select a node. The node will be placed at the end of your workflow. Right click or control click on the canvas, and a contextual menu will appear to select a node. The node will be placed wherever your cursor was located when you clicked. To duplicate a node, hold down the option key while dragging on the node. Read here for a list of available nodes. Click on a node present in the canvas to select it, then hit the delete key. Select multiple nodes by holding down the shift key while clicking on each node, then hit the delete key. Delete all nodes in the canvas by clicking once on the canvas, then use keyboard shortcut ⌘A (or menu item Edit ▸ Select All) to select all nodes. Hit the delete key. Click on a node in the canvas then go to the menu item Edit ▸ Delete. 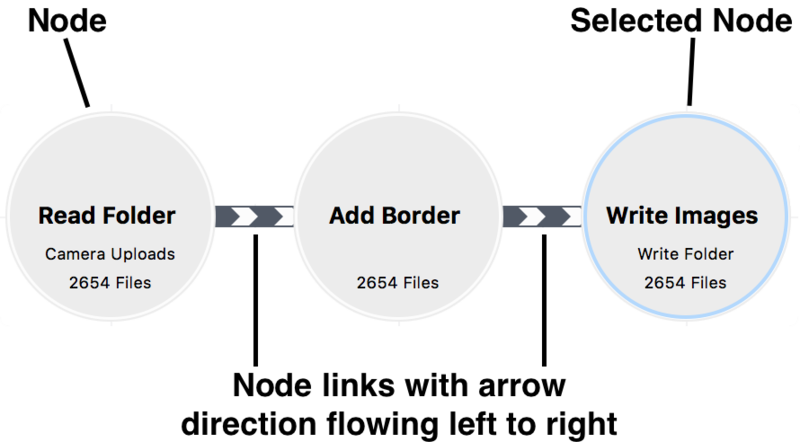 Workflows can be loosely created in a left to right configuration on the canvas. Click and drag on nodes to rearrange them in the canvas. Nodes can be linked to multiple other nodes to create branches in the workflow. When nodes are close enough, they will link. To unlink nodes, drag one node away until the link disappears. Retrobatch will process the nodes present by following the arrow direction shown in the links. If the arrows are going the wrong direction, unlink the node and then move the node to the left or right. In general, nodes preferentially flow in a left to right direction. There is a preference to disable automatic linking via Retrobatch ▸ Preferences ▸ General ▸ Manual connections with control drag. Node connections will only created by holding down the control key and dragging out a connection between two nodes. To delete a connection when this preference is checked, click on the connection to select it then hit the delete key. The inspector palette located on the upper righthand column is where node settings can be edited. Clicking on a node in your workflow will show that node's options in the inspector palette. A checkbox option is present in the inspector to enable/disable the node. This tells Retrobatch if the node should be included when the workflow is run. Read here for further details on node capabilities. If there is no Write Images node, an orange exclamation point will be present in the processing bar. If there is a Write Images node, but no folder is selected, the node will have an orange border. Adding the 'Open in App' node (Pro Version) after the 'Write Images' node results in the images Retrobatch has written opening in another selected app. The images passed to the app do need to have a representation on disk somewhere. For example, if you create the following workflow: Read Folder → Color Invert → Open in App → Write Images, you won't observe the color invert edits when the images open in the app, because they weren't written to disk prior to the Open in App node acting. The workflow would need to be Read Folder → Color Invert → Write Images → Open in App. After opening Retrobatch, a welcome window will appear. To bring up this window again, go to menu item Window ▸ Welcome to Retrobatch. From here you can choose to create a new workflow, open an existing workflow, or select a template.